First in a three post series this week about social media case studies. If your blog is essentially a post-modern diary where you share your deepest, personal feelings about life in a cathartic way, this is not the post for you. However, if you blog (or want to) because you are trying to build or grow your business, read on. For my presentation at the recent PodcampAZ, I boiled down everything I’ve learned about blogging in the 16 months since launching Convince & Convert into 11 must-dos. You, the readers of Convince & Convert, are what make this blog successful, and I am sincerely grateful for each of you who spends some of your limited time here. I hope I can give back to you (at least a little) by distilling what you’ve taught me about blogging. I started Convince & Convert on July 1, 2008. Since then, I’ve published 225 posts. I’ve redesigned the blog once (here’s a post about that process), and re-written the social media consulting and social media speaking content numerous times. Patience is a requirement for successful blogging. Every blog starts out with precisely the same number of readers: zero. The goal should be to gain a few readers every day, and over time you have a viable blog community. I started with 312 total visits in my first week (mostly friends and family), and it took almost 10 months to cross the 1,000 visits per week threshold. This blog now averages approximately 3,500 visits per week. Being found in search engines is a similar, long-term process. I initially had 46 visits per week from Google searches. Now, it’s nearly 1,000 visits per week. In addition to patience, here are the 11 must-dos to build and sustain a successful blog. Who is the audience for your blog? What is your blog about? What similar blogs exist? How will you measure success? All of these are blog strategy questions you should answer. I encourage you to actually write down your answers, to make them more “real”. It’s okay if you don’t know the answers before you start blogging. The results of your early blogging will inevitably change the direction of your blog. This blog was originally devoted to all things digital marketing, with a focus on helping ad agencies improve in that area. Over time, the topical focus narrowed to primarily covering social media, and while I work mostly with agencies as a consultant, the content here isn’t necessarily agency-specific. I made those changes based on feedback from you, and from the successes and failures of my first wave of posts. That’s why I discourage you from promoting your blog aggressively until you’ve written approximately 50 posts. You’ll end up marketing something different from what you’ll become. The more you blog, the easier it will be to build an audience for your blog. Seven posts a week is better than five, and five is better than two. Many bloggers write when inspired, but I don’t have the discipline for that approach. I write on a schedule, and publish here every Tuesday, Wednesday, and Thursday. I’ve found through experimentation that writing on consecutive days helps with your blog traffic, as you can more easily build momentum between posts. Also, some days you just won’t be able to write. So always have a handful of posts that are not time sensitive saved as drafts that you can publish when needed. Remember that your blog is essentially a magazine, and there’s a reason why magazines have many different types of articles in each issue. Mix feature length blog posts (like this one) with shorter, breezier reads. Mix timely post with timeless posts. Mix text with video blog posts. Mix positive with negative. Mix personal with professional. Also, don’t over-think your blogging. Some of the most popular posts I’ve written were those I just knocked out in a few minutes. And sadly, some of the least successful were those that I really thought about and crafted. Individual post success can be fickle, so don’t worry about it too much. Create good content, and it will find an audience. Include images in every blog post. I use Flickr’s Creative Commons search engine to find images for Convince & Convert. I also sometimes use affordable stock images from Shutterstock. Jason Falls’ excellent blog Social Media Explorer also uses Shutterstock. Sometimes (like with this post) the imagery isn’t a photo, but rather a presentation or a video clip. Where possible, don’t just ramble, be helpful. I create free social media tools that hopefully help you put the ideas we talk about here into practice. You should do the same thing. Create presentations. Publish checklists. As Chris Brogan says, find a way to give your ideas handles. I’m a big believer in building an anchor for your blog. A signature, routine series of posts that you can go back to with regularity. Steve Woodruff used this tactic to great effect when he published his Five in the Morning series. He documented the best social media blog posts of the day. Every day. Talk about utility! Mack Collier had an anchor at his must-read blog The Viral Garden that ranked the top 25 marketing and social media blogs by number of RSS subscribers. The anchor here at Convince & Convert is the Twitter 20 series, where I interview social media luminaries live on Twitter, and then create a blog post of the transcript. I’ve done nearly 25 of these interviews now, and publish a new one every 2-3 weeks. Whether you’re solo or part of a group blogging effort, being personal and showing yourself is critical. If people want to read content created by a nameless, faceless entity they can read a newspaper. Blogging is PERSONAL. That’s the whole point. Thus, I recommend having a prominent picture of yourself on every page. And if it’s a group blog, have thumbnail images of the author of each post. Also, don’t completely hide your real life from view. Remember, your personal life is a lot more interesting than your professional life. I learned from Valeria Maltoni that I wasn’t fostering community on this blog as much as I should. Based on her incredible efforts to connect her readers together to form a community over at her outstanding Conversation Agent blog, I built a formula for fostering community on a blog. It’s called WFACT. W=Welcome. F=Facilitate. A=Answer every comment. C=Connect. T=Thank. In addition to answering (nearly) every comment, I’m a big believer in acknowledging readers and contributors in other, subtle ways. That’s why I use the “Recent Readers” tool over on the right (via mybloglog). I’ve also seen success with the technique of asking readers for help in figuring out social media issues. Amber Naslund is exceptionally good at making her blog seem like a group project. It’s a best practice, to be certain. One of the primary benefits of blogging is that blogs do very well in search engine results. Hubspot released a study recently that showed that Web sites with a blog received 55% more traffic than those that didn’t have a blog. You need to realize that the most important reader of your blog is Google, and that every blog post is more bait in the water for search engines to nibble upon. I’m not saying you need to write your blog for search – far from it. But, it’s certainly a good idea to include search terms in your post URLs, titles, headlines, and subheads. I don’t do this for every post, but where it makes sense I absolutely pay attention to search terms. In fact, last April I wrote a post called Should Facebook Dominate Your Social Media Strategy? Based on including “social media strategy” in that post in a search-friendly way, I went from #55 to #17 in Google in one day for the search term “social media strategy”. Paying just a little attention to search can pay big dividends for your blog. Being a good blogger doesn’t end at your blog. Mack Collier once told me that for every hour he spends on his blogs, he spends three hours reading and commenting on other blogs. Being a good commenter is a fantastic way to increase awareness for your own blog, provided you do it in an honest way, and always add to the conversation. In addition to blog commenting, there are other ways to repackage and extend your blog content. Can you create an ebook of your best posts? For example, Dave Fleet (whom I interviewed on Twitter) has a great ebook of corporate social media policies. Maybe you could also create an email newsletter that combines your best posts with other interesting content? Jason Falls has a great newsletter. Chris Brogan, too. And I’ve recently launched my own called Social Media Messenger. It goes out every two weeks with links to the four social media stories you simply can’t miss. The Convince & Convert business model is that what I do on Twitter drives traffic to this blog. The blog generates speaking engagements for me. And speaking engagements yield consulting clients. So, I unabashedly promote this blog on Twitter, and encourage you to promote your blog as well. Twitter may or may not be the right place for you. It might be Linkedin. Maybe Facebook. Maybe a vertical industry community. Experiment and find out what works for you and your readers. But realize that you can only promote yourself and your work in social media if you promote other people as well. Reciprocity is key. Also, you cannot underestimate the importance of headlines. In almost every case, a potential reader only has the headline of your blog post to determine whether to click. Thus, to be a good blogger you must be an excellent headline writer. Michael Stelzner at Social Media Examiner is the all-time best at this, one of the reasons his excellent group blog has become very popular almost immediately. My headline rules include brevity, challenging conventional wisdom, using numbers/lists (like this one), using unexpected action words, and incorporating search engine keywords. Thanks to you, I’ve learned a lot about blogging over these last 16 months. I know I’m just scratching the surface. What have I missed? 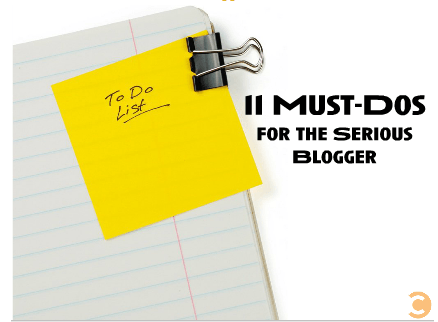 Can you please help me uncover other must-dos for serious bloggers?